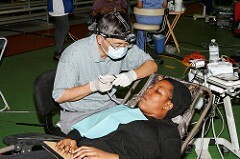 On October 29, 2011, 5 dentists, 11 hygienists, 3 dental assistants and 10 general volunteers from HMO participated in the first Calgary free dental clinic for the Wing Kei Nursing Home for the seniors. Most the seniors are in a wheel chair and in their 70’s to 90’s. They lacked proper access to regular dental care for many years. This mobile free clinic was able to offer basic dental care at their residence. Many geriatric patients refused to open their mouth due to many years of lack care and fear. It took up to 4 volunteers to transfer them to portable dental chairs. with patience and gentleness, most seniors received their treatment and with big smile on their face. The management of Wing Kei , the seniors and their relatives are very thankful and asked for another clinic as soon as possible. We are tired but very happy to be able to serve them. We would like to thank all of the volunteers who graciously donated their time to helping the people in need.